My son first showed me this proposal for a cycle-track in downtown Portland. 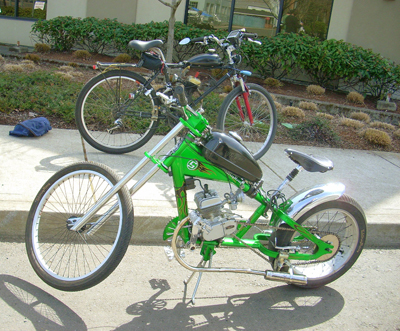 He is a daily bike commuter, riding a respectable distance to PSU, and these sorts of transportation improvements are especially important to those that are riding on a regular basis, through all types of weather and lighting conditions. Â It would be great if this could be accomplished.Â Portland has been making remarkable progress to promote bicycling and to make it safe for everyone.Â And Sam Adams has been a big part of that. The other night, hometown indie rockers The Decemberists gave a national-TV shout out to Portland as a “big biking town” on the Colbert Report (watch the video above). This morning, Portland Mayor Sam Adams went a step further, promising to remove one of three automobile lanes on a stretch of Southwest Broadway for a high-capacity “cycletrack” near Portland State University. PBOTA schematic of the proposed Broadway cycleway being pushed by Mayor Same Adams. This entry was posted in Bicycling & Fitness on April 30, 2009 by golinielcomblog. We have a bicycle tour plannedÂ for The Netherlands later this summer. I imagine I will have more to say on this later, but the first step in preparation is to unpack the folding Bike Friday bicycles and take them out for the inaugural ride of the year.Â So its out through Gladstone to Oregon City for some fun in the sun, a tour of the local bridges and a turn-around conveniently located at a Starbucks. Out on the back-roads we stopped to talk to 3 guys who were preparing to take their motorized bicycles out for a trial.Â These are actual bicycles that they have outfitted with 48cc engines, apparently from a kit for just this purpose.Â They claim aÂ top speed of 45 on them. I am comfortable doing 45 on my bicycle, I am somehow uncomfortable with doing that on a bicycle with a motor. From here is was across the Clackamas on the Park Street bike/pedestrian bridge,Â along the paths following the Clackamas and then a cruise through Clackamette Park. 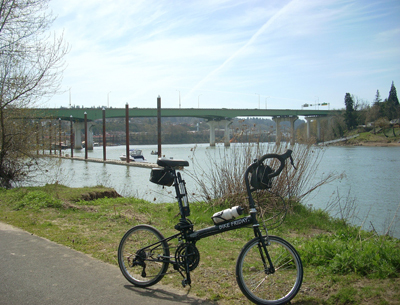 … and then towards Oregon City along the Willamette.Â There’s a short path from Clackamette Park that leads to Oregon City.Â The later part is still closed due to some traffic improvements along McLoughlin, but we wanted to get down there to see the progress as it is part our full bike commute. 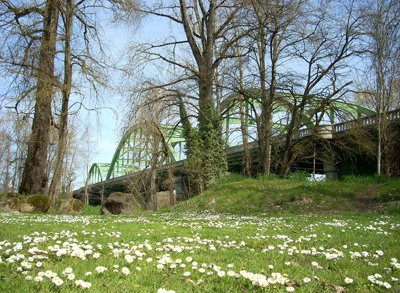 We can ride just past the under side of the Glenn Jackson bridge, which is I-205 over the Willamette, then its time to head back to find that Starbucks. This entry was posted in Bicycling & Fitness, I just don't fit in... on April 11, 2009 by golinielcomblog. The final monkey has been captured. BEAVERTON, Ore. — Nine monkeys who escaped from cages at an Oregon Health & Science University campus have been recaptured, OHSU officials said Saturday. The group of monkeys escaped when a caretaker cleaned an outdoor cage that housed the monkeys, said Jim Newman, an OHSU spokesman. Of the nine monkeys that escaped, Newman said four monkeys were quickly captured. A fifth was caught Friday night and three more were captured by Saturday night. The final monkey was captured at 2 p.m. Sunday on the OHSU primate center campus. The monkeys were seen Friday along the south edge of the university’s west campus on Southwest 185th Street in Beaverton — an area near the MAX light-rail line. This entry was posted in Social on April 7, 2009 by golinielcomblog. Up to a dozen waterfront homes were damaged on Whidbey Island, some seriously, after a 6-foot wall of mud and logs came barreling down a hillside and Friday morning. News Video of the Flood Damage. Wait, is that my sister-in-laws sister being carried through the mud? This entry was posted in Our Environment on April 7, 2009 by golinielcomblog. There are web traffic tools like Awstats, others that may be provided by your IP, that many among other things can tell you what other sites are referring traffic to yours.Â In some cases thats good. In other cases, what that means is that people have linked to images on your site.Â So, when someone is viewing their site, they are also linking over to yours, taking up band width, just to view the picture, that the other sites administrator didn’t upload, thinking its easier to just paste in the link. Not a real good practice, since if the image is moved, renamed or removed from my site, then it goes missing from theirs, and now it just looks wrong.Â Â What may be worse is that in so many cases, there is no byline mentioning the source of the image.Â Its goodÂ practice to mention the source of the material you are copying, instead of just leaving the viewer the impression that everything they see on your site is your work.Â Â Anyway, its interesting to see who is using what stuff, and just how they might have found it in the first place.Â Â Here’s a partial list of some of the sites I have found to date, though the images in question aren’t always directly related to the link, or to the front page. This post is pictures of falls from around the world. Tons of falls pictures out there, andÂ she included mine? I have yet to figure out that this site is really about and why this picture is on it. In this case, he even says right there under the image: “Since this all published artwork, I’m linking to their art instead of republishing it. This also means that the links could die.” He provides a link to the artists site, but still links his image to the Frazz trip on my site to mine. He didnt ask me and I know this guy! This bike rider blog linked to the site of the comics author, but linked the the same Frazz strip on my site. A girl from an east coast college that likes long rides found the Frazz comic strip on my site about biking. Little story about her bike ride to OHSU, and my picture of the OHSU tram. This site just compiles images on a subject and it found mine. I’m thinking one of these days I am going rename my images and then use those old image names for pictures of monkeys. 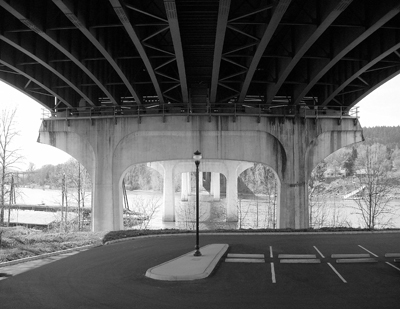 This entry was posted in Make a Photo on April 3, 2009 by golinielcomblog.